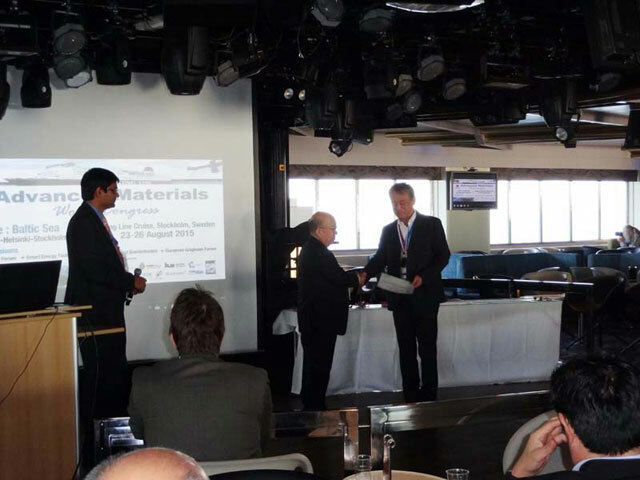 Professor Yasushi Tamada of the Faculty of Textile Science and Technology Bioresource and Environmental Science Course won the IAAM Medal-2015 (IAAM : International Association of Advanced Materials) at the Advanced Materials World Congress 2015. The congress was held on board a ship in the Baltic Sea between Stockholm, Sweden, and Helsinki, Finland, from August 23 to 26. This medal is awarded to researchers who have conducted outstanding research in the fields of materials science and technology. Professor Tamada has been carrying out research under the theme of developing technologies for using silk proteins. In short, his research has focused on developing cell scaffold materials for use in regenerative medicine that utilize the biocompatibility of silk proteins. Through this research, which was conducted on collaboration with Kyoto University and Toho University, he has developed a new system of treatment for joint cartilage regeneration that uses the porous structure material fabricated from silk. In addition, through research aiming to shed light on the relationship between silk and cell behaviors that is basis on developing cell scaffold materials, he has provided insights into the particular characteristics of silk materials, and has also succeeded in developing techniques for creating new non-woven fabric from nanofibers and in developing simple techniques for modifying the surface of silk materials. It was in recognition of this series of research achievements that Professor Tamada won the award.